With just a few days left until the 19th Conference of the Parties (COP) of the United Framework Convention on Climate Change (UNFCCC) conference draws to a close, time is running out to reach a meaningful agreement on providing climate finance for developing countries – a key component of the negotiations. But as shown in a briefing released by Oil Change International today, while Annex 2 (developed) countries continue to debate how to honor their commitment to provide $100 billion each year by 2020 to help developing countries reduce emissions and adapt to climate impacts, these same countries are providing five times more public support for fossil fuel production and consumption than they have so far pledged in climate finance. These fossil fuel subsidies are driving the global growth in greenhouse gas emissions and therefore directly undermining investments to reduce climate impacts. In an effort to provide shorter term resources and build frameworks for climate finance, developed countries had collectively committed to $30 billion of “fast-start” climate finance from 2010 through 2012. Based on self-reported data compiled by the Open Climate Network, these countries slightly exceeded their commitment, contributing $35 billion of climate finance over the three years – an average of $11.7 billion per year. 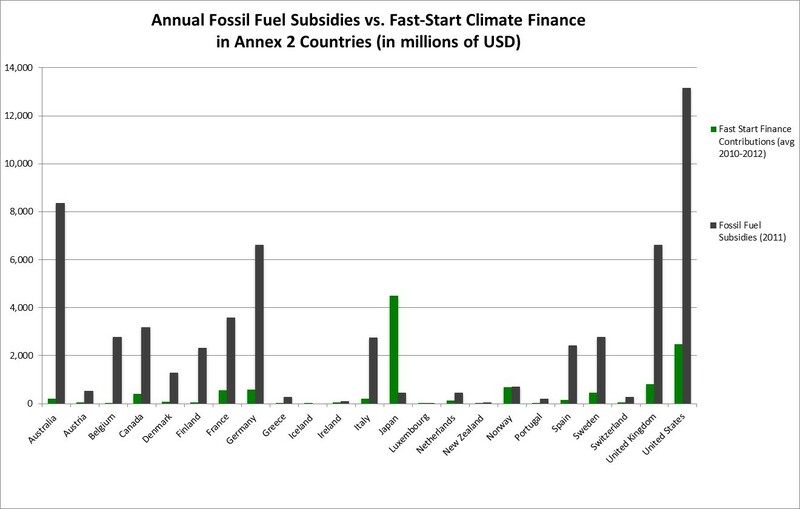 However, according to data from the Organization for Economic Cooperation and Development (OECD), in 2011 fossil fuel subsidies in these same countries totaled more than $58 billion, more than five times greater than average annual climate finance over the fast-start period. This massive expenditure of taxpayer money to bolster the oil, gas, and coal industries continues more than four years after G20 member countries pledged to phase out inefficient fossil fuel subsidies. In order to ensure meaningful progress on climate finance in Warsaw, Annex 2 countries should commit to predictable and steadily increasing levels of public climate finance through 2020. Clear guidelines for calculating and reporting climate finance contributions are needed to hold developed countries accountable to their promises. 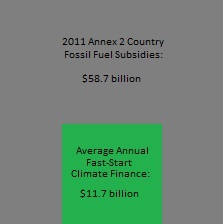 Developed Country Climate Finance vs Fossil Fuel Subsidies, by Country. Source: OECD 2013, OCN 2013.
assistance and safeguards for the poor and most vulnerable who must be guaranteed access to energy. Read Oil Change International’s full briefing. This post has been revised to reflect updated data on Fast-Start Climate Finance. Oil Change International received notification of the error in the original data on November 22 from the World Resources Institute, who provided the updated figures that are now reflected in the briefing. OCI and WRI regret the error.